Orange County’s newest centenarian Opal Shields was honored with a proclamation and a special luncheon at the Taft Community Center on her 100th birthday. Shields’ service to her community began after graduating from Florida State College for Women (now Florida State University) in 1936 when she began her 34-year teaching career. From 1948 to 1975, she taught grades five and six at Taft Elementary School until she retired. During World War II, she joined the United States Navy as a member of the WAVES (Women Accepted for Volunteer Emergency Service) initiative where she once assisted famed aviator Charles Lindberg with a weather report. She was later stationed in Washington, D.C. where she decoded Japanese weather reports for the U.S. troops in the Pacific area. Since her retirement in 1975, Shields has attended the Taft Community Center’s Seniors First Neighborhood Lunch Program and has volunteered to knit hundreds of infant hats, which have been donated to the Winnie Palmer Hospital for Women and Babies. “Orange County honors Opal Shields for her 100 years of service to our community,” Mayor Jacobs said after delivering her proclamation. Shields’ was a distinguished guest of honor during Mayor Jacobs’ 2014 State of the County address in June. Shields traveled by SunRail to the event with Commissioner Jennifer Thompson from Orange County’s Sand Lake Road Heart of Pine Castle Station. In addition to her family and friends, Shields was joined in celebration by several of her former students. 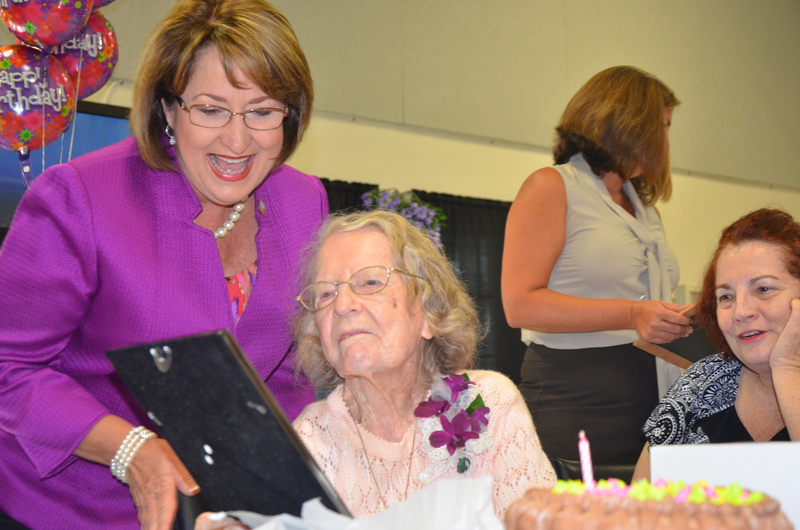 Shields’ 100th birthday celebration was sponsored by Seniors First, which enhances the quality of life for Central Florida senior citizens by maintaining their independence and dignity through nutrition, home improvement and support services. A collection of photos from Opal’s birthday celebration with Mayor Jacobs can be found on Flickr.